When you provide exceptional customer experiences, increased advocacy and revenues are your reward. We recognize the difference between loyalty (customers recommend you when asked) and enchantment (the highest order of advocacy – customers become part of making your business a success). We understand that experience management is complex, because every interaction with a customer contributes to their experience, shaping their perception and expectations. That’s why we have developed unique methods to demonstrate how multiple activities impact customer experiences. 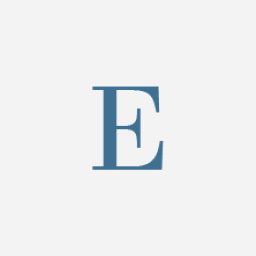 Endeavor assists our clients in developing a customer focused approach to achieving their business goals. 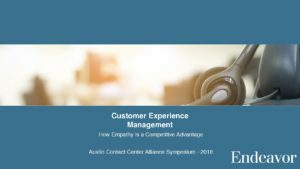 Gaining a deeply intimate understanding of customer behavior is at the heart of the relationship required to engage both customers and employees. 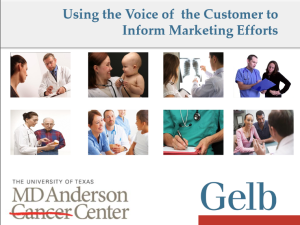 An organization’s ability to understand, act upon and internalize customer information has a direct and tangible impact on business performance. 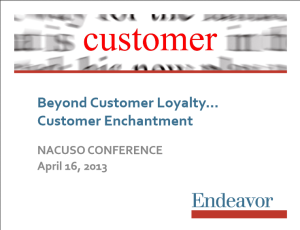 Endeavor brings a unique approach to aligning your company to its customers through a multidisciplinary approach. Your organization is unique, so we customize our proven experience management methods to enhance your customer-focused culture. An in-depth understanding of customers’ needs, expectations, and how they receive value through touchpoints. Understanding customer experiences can be complex, and unfortunately customer satisfaction surveys alone usually do not provide sufficient insight. Experience mapping is a means to develop a deeper understanding of your customers’ experiences and expectations – and to ultimately create advocates out of your customers, because they are enthusiastic about the exceptional experience that you provide. A quantitative assessment of why and when customers buy and what drives enchantment. This technique validates current behaviors and allows organizations to group customers into similar categories for service improvement and messaging. Experience Design assists in building desired behaviors from the ground-up, promotes consensus and creates meaning for those who serve your customers. It is also one of the few times that cross functional groups can come together to creatively solve strategic problems that matter – those that impact the experience you deliver. CRM Implementation services will maximize your sales potential through the use of timely information. Our approach includes architecture, configuration, testing, training and support of your new CRM software implementation. Your company’s culture is an expression of your brand. 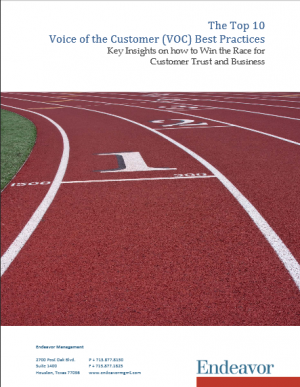 It is deeply intertwined with the customer experience and can can be a source of strength for growth or it can be a constraint on strategic change. The internal and external perceptions of your culture and can put at stake your company’s very ability to be trusted by its customers at the grassroots level. Real-time tools designed to elicit feedback and escalate issues for service recovery. A Customer Experience Dashboard tells you what your customers are thinking; it is a tool that allows you to influence and enhance your relationships by immediately responding to what they are saying. Our facilitated process provides in-depth feedback by directly engaging end-users – it is designed to give your business immediate insights about how to increase website effectiveness and value. 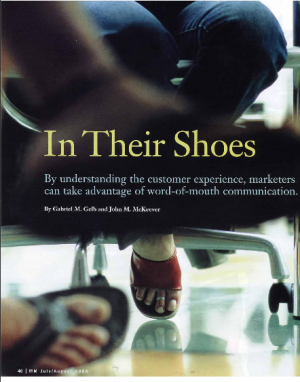 By understanding the customer experience, marketers can take advantage of word-of-mouth communication.